Alpha Dice are the dice component of the Alpha Word Game System. They can be used with other components of the game system to play games or by themselves to play games. There are already several different games that you can play with a double set of Alpha Dice and more will come. 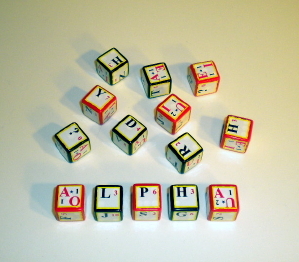 The Alpha Word Game System uses a double set of Alpha Dice. A double set of Alpha Dice contains two identical single sets of Alpha Dice. The only difference in the two sets is the background color of the die, which makes it easier to separate the sets if needed. A single set of Alpha Dice contains seven dice. If you would like to see the current games you can play with the Alpha Dice go to Games. If you would like to print out and make your own sets go to Download. Here is a breakdown of the six die faces on the seven dice. The consonants have their point value included, all vowels are worth 1 point except for U which is worth 2 points. (The vowel followed by an * is the marked vowel). The Wild is the ? mark. When the vowels are used as marked vowels there are 3 A's, 4 E's, 3 I's, 2 O's and 2 U's available in a set. When the vowels are used as semi-wild there are 6 As, 6 E,s 6 I's, 5 O's and 5 U's available in a set.